"You're discussing tactics. Do you realize what this really comes down to? Millions and millions of lives hanging on what this vessel does next." Other Stars: James Doohan, Nichelle Nichols, George Takei, Mark Lenard, Robert Walker, Jr.
As good as Star Trek can be, it always has had a tendency towards moralizing or an overly-saccharine quality. Often these qualities are buried under layers of action and sci-fi goodness. Sometimes, however, these qualities rise to the forefront of the show, and in retrospect, they only detract from the series. And Charlie X is a perfect example of those qualities. The episode starts when Charlie Evans (Robert Walker, Jr.), the sole survivor of a starship crash about a decade before, is beamed aboard the Enterprise after he is discovered alone on a seemingly desolate planet. Charlie learned to survive on his own, but the lack of human contact (he learned English from the crashed starship's computer) leaves him at a disadvantage now that he is surrounded by people. He sees an attractive yeoman and falls in love with her, despite the fact that she is much older than he is. Charlie becomes frustrated when the yeoman rejects his advances, and Kirk tries to be a surrogate father figure to Charlie and ease his entry into the populated universe. But Charlie seems to display dangerous powers that could threaten not just the entire ship, but any planet Charlie steps foot on. This episode has two crippling problems. First, the majority of the episode consists of dialogue. This is where all the excessive moralizing comes in. Kirk and McCoy talk endlessly about what is best for a growing boy, and, frankly, no one wants to hear it. Once Charlie's reality-shifting powers are discovered, Kirk and Spock talk endlessly about how to deal with him, and how to reconcile the fact that he's just a boy with the fact that he has dangerous powers. This leads to the other problem. Charlie is like a miniature version of Q from Star Trek: The Next Generation, he can change some of the physical reality around him with a thought (although he's not nearly as powerful as Q, who routinely created alternate realities for characters to deal with). There is no way to deal with such a character. How do you defeat a person who can make you disappear without lifting a finger? This type of episode requires a stretch for an unsatisfying way to solve the problem of fighting a seemingly unbeatable foe. Another problem is Robert Walker, Jr. While the series was always known for camp acting, Walker is just bad here. The real trick of the part lies in making the character sympathetic, even though he's a spoiled brat who is used to getting his way. Walker doesn't appear sympathetic. His idea of playing innocent looks more like playing the fool, and when he shows his powers and how he uses them, everyone wants him gone. This episode is supposed to be tragic on some level, but it's really the bulk of the episode itself that is tragically bad. While this disc may contain one dog, it also contains one classic. Balance Of Terror has got to be one of the best of the entire original series. Kirk and the crew come in contact with a Romulan warship, more than 100 years after humans and Romulans had a giant war. The result of that war was the creation of a Neutral Zone between Federation and Romulan space. The Romulans have finally decided to cross the Neutral Zone, attacking Federation patrols stationed on asteroids with a new plasma weapon. The crew arrives to find no ship in sight, but amazingly, a ship appears, attacks, and then disappears. The Romulans have a cloaking device that renders them invisible. And so begins a cat-and-mouse game between the Enterprise and this Romulan warship, and if the Enterprise fails to defeat their adversary, the result could be intergalactic war. This episode alone adds a significant chapter to the Star Trek universe. Before this, the Klingons were the main enemies of the Federation. In this episode the Romulans are introduced, along with their history and what they mean to the Federation. This warrior offshoot of the Vulcans will have a major effect down the line, in both the original series and all of its follow-ups. And the main storyline proves as exciting as anything in the Trek universe. Both Kirk and the Romulan Commander (played superbly by Mark Lenard) can only guess at what the other might be thinking, and so every move they make might mean success or failure. For a comparison, I would say that this episode is as exciting as the climax of Star Trek II: The Wrath of Khan. Except the climax of Khan plays out for about 20 minutes, while this episode keeps up the excitement and suspense for almost its entire running time. 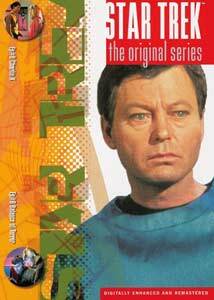 Image Transfer Review: It's Star Trek alright, and it looks good. Like the rest of the series, these episodes shine with clarity and a very exacting color palette. The grainiest shots are those of the ship in space, but that is to be expected. I couldn't find much dirt on either episode; they're all clear. Especially gratifying to see are the deep reds, blues, and purples of the action sequences in Balance of Terror. Not one compression artifact can be found anywhere. Audio Transfer Review: As with all of the discs, these episodes get a brand new 5.1 remix. For the most part, these mixes are conservative. For once, I'm not complaining. Charlie X is so dialogue-rich that an overactive 5.1 mix surely would have distracted from it. Overall, the music makes the most use of the surrounds, albeit it in a subtle way. The dialogue is centered in the front three speakers. The action sequences in Balance of Terror display a nice bass end, and the explosions sound like you'd think they really would if you were on a starship. Extras Review: The whole series on DVD is particularly extras-poor, including only the "Next Voyage" teasers shown at the end of each episode when they first aired. It's a shame that this influential series has so few extras, especially with new DVD packages like Twin Peaks packed with extras. This disc contains one of the worst episodes of the series and one of the best. Is it worth getting? Well, if you're a Trekkie, then you'll already want this, regardless of what this review says. If you're not, I'm not sure. Do you want to spend money on a disc where you'll only ever watch half the content? I guess each individual has to decide for themselves.